Thanks to NB Bluesbreaker and Zita the dog for the photo. Due to an unplanned departure, there is one long-term mooring, (not residential), now available in the main, open part of the arm. Short term and overnight moorings are available most of the time. Please call 07456 166761 if your need is urgent. We also sometimes have winter moorings available. 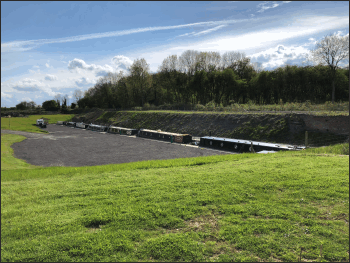 The restoration of the 1870's Charles Nelson Cement and Lime Works basin was completed in September 2017 and we now have long term leisure moorings for up to 8 narrow beam boats with additional spaces for medium and short term visitors. All the permanent moorings have power and water pedestals so are within a hose length of water and an extension lead of electrical power. Elsan and rubbish disposal is separate from the moorings, (short walk with one of our wheelbarrows or your car). To avoid a smelly pump out station, our pump out kit is mobile so we come to you to empty your tank. When our main long term moorings are full, there are three ways you can wait for a place to become free. One is to pay the mooring rate and moor on the Standby Mooring which is under the footbridge. It has the same facilities as the main moorings but, because it is in between the old railway bridge supports, it doesn't have the same open views. The second choice is that you can pay a £500 deposit and third is you can go on the nonpaying waiting list. When a place becomes free we offer it to the Standby Moorer first, then the Deposit Paying Moorer second and finally to the Waiting List person. The only ways you can jump the strict pecking order is if a moorer ahead of you declines the vacant mooring. If you ask to move from one waiting list to another then we would still offer the opportunity for the people in front of you to move up first. 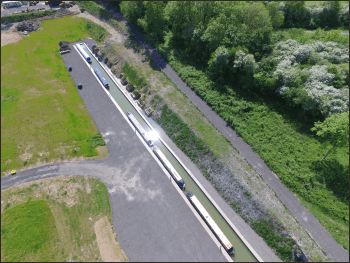 E.g., if no-one was on the Standby Mooring and a new customer elected to go on it by paying the full mooring fee then we would inform the other deposit payers first to give them first refusal. 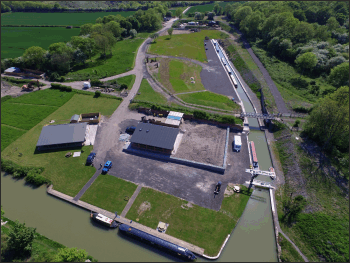 Permanent moorings are along one side of the arm so you have unfettered views from both sides of your boat and boating access to your mooring is down the other side of the arm so you aren't blocked in. Secure parking is within a few strides of your mooring. The basin is fenced off from the general public with coded electric gate access, (no need to get out of your car to open a gate). We have a 24hr on site presence at the moorings. Moorers have access to a picnic area with tables, seating and barbecue stands. There is also a sheltered clothes drying area next to the temporary moorings nearer to the wharf. Moorers also have access to reduced room rates in the new accommodation block for relatives and friends to stay. Internet access is important for some boaters so we are in the process of having fibre to the premises installed by so we can offer high speed internet WiFi access in 2018. The basin is next to a SSSI, (Site of Special Scientific Interest), and nature reserve which is part of our 40 acre private estate known for its rare butterfly population. It is an idyllic spot to keep your boat, relax in peace and a great place to walk dogs. Nelson's Wharf is on the Grand Union Canal in the long pound between Stockton and Calcutt locks and, being on the Warwickshire Ring, it is very central for the canal network . Turn right out of the basin and you have the choice of the GU canal to the south and ultimately London or the Oxford canal with a choice of south to Oxford or north to Rugby and Coventry. Turn left out of the basin and its off to Birmingham via Leamington Spa and Warwick. The Wharf is equally accessible by car. Our private, electric gated entrance is on the A426 Southam to Rugby Road just north of Stockton Village crossroads. The village of Stockton with a village post office is about 15 minutes walk away down a public footpath. In the other direction, 5 minutes across the fields, there is a public house, The Boat Inn, where there is also access to a bus service running between Leamington Spa, (via Southam), and Rugby. Be assured that Nelson's Wharf will never be expanded into a bigger marina. Our intention is to create a unique mooring environment for a limited number of craft.